A, B, C, D: mid-knee length. E: 3" above mid-knee. A, B: pleats, ribbon waist finish, self-fabric tie at sides and back zipper closure. A: features a border print. C: gathered tiers, elastic waist finish, purchased trim at tier seams and self-fabric tie at center front casing. D, E: elastic waist finish with self-fabric tie at center front casing. D: ruffle at lower edge. E: ruffle at lower tier. Notions description...NOTIONS: Skirt A, B: 7" Zipper, 1 yd. of 5/8" Grosgrain Ribbon, Hooks and Eyes. 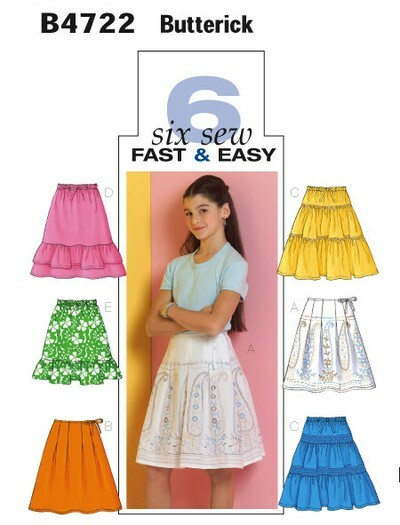 Skirt C, D, E: 7/8 yd. of 3/4" Elastic. Also for C: 4 yds. each of Sequin Trim or Approximately 1" Double-edged Crochet Trim or Lace.